Trivia: Thanks to his poker winnings, he paid for his sister’s college. He has ambitions of becoming a doctor. John is not the most well-known poker star, but he certainly is one of the most accomplished. Born on the magnificent island of Sumatra in Indonesia, he came to the United States in pursuit of his studies in 1990. John is a very clever man and completed his MBA at Seattle University. When he moved to Seattle, he began hitting the poker tables on weekends and would spend hours of time perfecting his gameplay and getting to know the tricks of the trade. 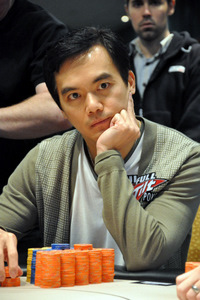 He began his poker career in the 1996 and rapidly ascended in popularity. He began to get noticed and he is now one of the top poker pros representing Full Tilt Poker. He earned himself 4 WSOP bracelets and won the Main Event NLHE Omaha, reeling in $1.54 million.